Sideshow Collectibles has taken the design of their classic Star Wars Mythos Obi-Wan Kenobi statue, which imagines the Jedi Knight between the two trilogies on Tatooine, and they turned it into an awesome 1/6th scale action figure! "I’d say we stayed pretty true to the original statue. It became such an iconic Sideshow Star Wars piece, and the original design was so appreciated by the fans, it really didn’t need much in the way of improvement. We had this unique opportunity, working with Lucasfilm to create a whole new moment in Obi-Wan’s life. There’s a huge responsibility there for us as artists, but also as fellow fans, to do that justice, and I think we did. 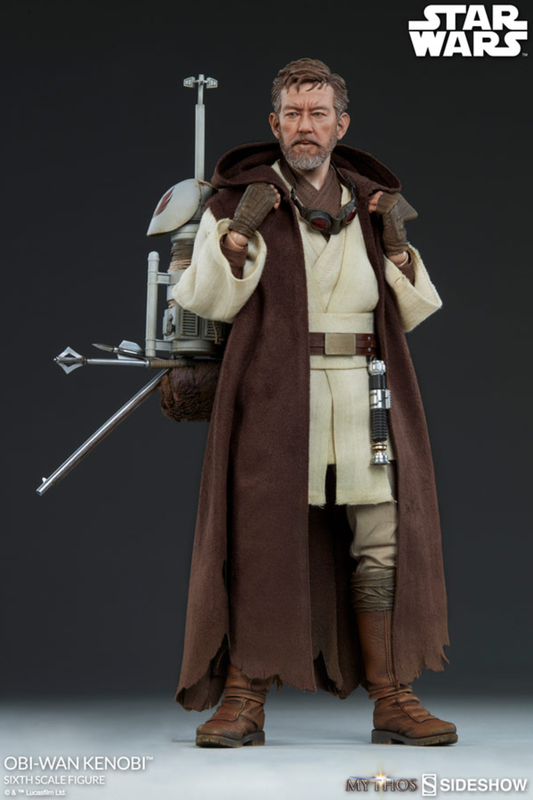 "For the new, smaller, 1:6 scale Mythos Obi-Wan, we made a few tweaks to the design here and there, but the most significant change came with a different medium. You can actually get a lot more clarity and fine detail when you’re working with plastics, so you’ll see that we ramped up the details a lot. Even though this figure is smaller in scale, the level of detail is much, much higher." Over the years, fans have said that if we ever saw an Obi-Wan Kenobi solo film that takes place in between the prequel trilogy and the original trilogy, this is what the character should look like. I don't think any Star Wars fan would argue with that. I love the look! Lucasfilm is currently developing an Obi-Wan Kenobi movie, and it's one of the Star Wars Stories that I'm really excited about seeing brought to the big screen. I just hope that they get Ewan McGregor back to reprise his role! First Look at Obi-Wan Kenobi in STAR WARS REBELS; New Trailer Teases a Rematch with Darth Maul!